One of my goals while I'm here is to learn to make delicious Turkish food. While at my friend Güleyse's house on Saturday night, I had one of my favourite things for dinner: Kısır. Kısır is a super healthy dish made with bulgar, vegetables and salça (a red pepper purée used as a spicy sauce). Determined to attempt cooking at least one Turkish recipe a week (or rather, a more realistic goal would be to just COOK once a week), I decided to make kısır to bring to my friend Kate's Sunday dinner. It went over great, I consider this dish a success, and it's so easy to make. 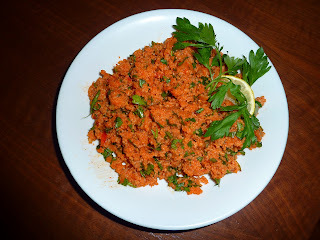 Bulgar is a great, healthy option for vegetarians. Combined with lentils, it forms a complete protein (something about Omega 3...that's what Colleen says). 3 cups of bulgar and equal amounts of boiling water. Boil water. While water is boiling, finely chop the vegetables. Put the bulgar into a large bowl and pour the boiling water on top. When bulgar has cooked and absorbed the water, stir in the salça. It should be a pretty red color. Stir in the veggies. Pour on a little olive oil and lemon juice. Stir and serve. sounds delicious, Kirbie. I wonder if we can find salca in Canada? I must look for it. Is that your photo? It looks great!